One of the biggest problems facing Western Civilization is figuring out clever ways to display a large amount of content in a small space. One effective solution involves placing content in sequential blocks using what is known in the industry (and the 'hood) as a content slider. You may have never heard of it, but I'm willing to bet that you definitely have seen and used it. Click on the circular links to see the slider in action. Depending on which link you click, the appropriate content will slide into view. Your content can be anything. It could be images, normal HTML content, a combination of things, etc. It really doesn't matter. If your content can live inside a div element, you are good. You just need to ensure that each individual block of content is the same width and height. This markup doesn't do anything outside of just setting up our document, but it does tee us up nicely for adding our content. Let's do that next. You will see four large rectangular blocks arranged neatly side-by-side. Depending on your screen resolution and browser size, you may need to scroll a little or a lot to see all of the squares. At this point, take a few moments and try to understand why you see the result that you see. Take a quick look at your HTML and notice the elements that are in your document. Pay attention to the class and id values that are used, because they will correspond to the style rules you added. Speaking of which, take a look at the style rules themselves and visualize what impact they have on what is shown. Once you've done this, let's recap all of this together. The .content style rule also specifies the float to be left. This results in your div elements lining up nicely on the same row. The last thing this style rule declares is the white-space property. This property defines how text in a paragraph will wrap. I simply provided this property as a convenience. If you decide to go beyond this tutorial and add some content to each of your div items, you'll either be grateful that your text wraps appropriately or remove this property (or set it to some other value) because you don't actually want to see it. As you can see, these style rules define just a background color and a background image that makes up our content. At this point, your div elements are no longer invisible. They appear as 550x350 sized rectangles with a solid color. This wrapper element encompasses all of our content into one single container. This isn't THE container I was referring to in the overview that clips all of the content. That one will make its guest appearance in a little bit. No, this element's purpose is to literally just wrap the content in order to help us slide everything around. This style rule first defines the width of the wrapper element as being 2200 pixels. 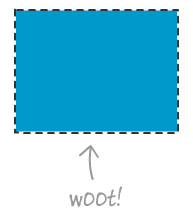 That is the total width of our content...which you get my multiplying 4 (for the number of div elements) by 550 pixels. The transform property with the translate3d function set us up for being able to position this wrapper anywhere we feel like it. Because our div content blocks are children of this div, they go where the wrapper div goes. As you can imagine, this comes in quite handy in world where things need to be slid around! Notice that you are sizing your contentContainer element at 550 pixels by 350 pixels. That is the exact same size as each of your content blocks. 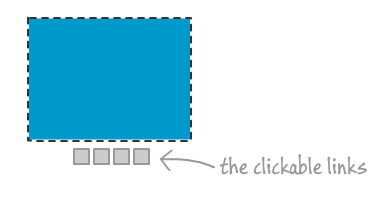 To help make the slider stand out a bit, we define a black border with a width of 5 pixels. The last thing we do, and this is the one that clips the content, is set the overflow property to hidden. What this does is it hides any content that goes outside the boundaries of the contentContainer element. Notice that only the content from your first block is visible. The rest of your content is still there, except it is simply clipped thanks to the overflow property's hidden value. 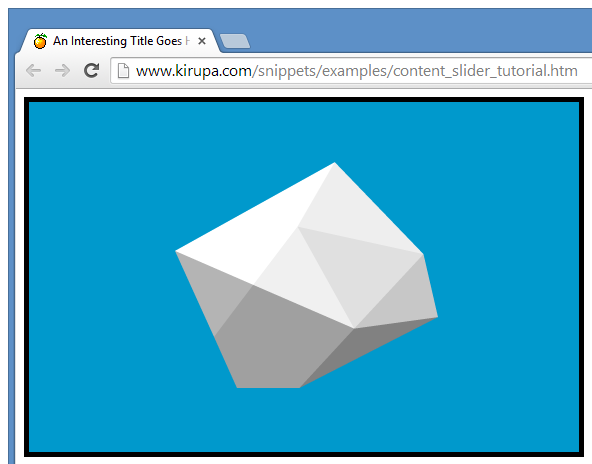 You can learn more clipping content by looking at the Clipping Content Using CSS tutorial. Let's take a quick look at the HTML you just added. To start off, you have a div with an id of navLinks that wraps an unordered list. The links themselves are made up of list items. Each list item contains a class value of itemLinks, and each list item also contains a custom data-* attribute called data-pos. We'll revisit the data-pos attribute in a little bit, but just know that this attribute exists for now. Wow, that is a lot of CSS. Despite the quantity, there isn't really anything unique or interesting going on here. 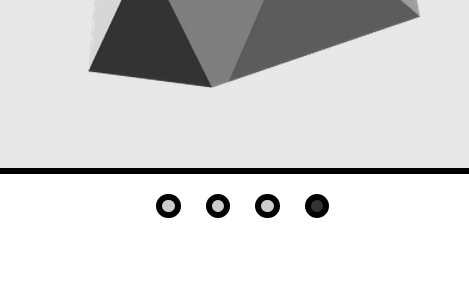 Part of the CSS goes towards making a horizontal menu with the links appearing side-by-side. The rest define the look of each link along with the corresponding hover state. If you recall from your HTML, there was no element that had a class value of active. Despite that, these style rules will eventually get used because the active class is added to one of our links dynamically. You'll see the madness behind this in greater detail shortly. If your slider doesn't look like that, there is a very high chance that there is some typo that is causing the problems...or something else. Aren't I helpful? If you've been following along all of this time without taking a break, I highly encourage you to take a short break. A great way to kill a few minutes without straining your brain is to browse through the excellently illustrated (and funny) Pusheen the cat blog. Once you have added this, go ahead and preview in your browser and click on any of the circular links. You will see that content corresponding to the link gets jumped into. Certainly, that's a whole lotta progress. All that we have left is to change the sudden jump into a nice slide. Right now, you have a content slider that doesn't actually slide to the content. It jumps to the content instead. To make our content slide, let's use a CSS Transition. Let's add one of those to our slider. The line you added defines a transition. The properties on it specify that the transition should come to life whenever the transform property is modified. Your transition will run for .5 seconds and will use a ease-in-out timing/easing function to speed things up initially and slow things down towards the end. That's all there is to animating your content slides! If you preview your document now, you should have a working content slider that slides your content when you click on any of the navigation links. This should be identical to what you saw in the example towards the top of this page. Now that you have a content slider that works, let's try to understand how the code helps tie everything together by starting at the very beginning. Clicking on each link slides your content left and right depending on which content needs to be made visible. The way the content slider knows which content to pull into view is because of an unholy alliance forged between each navigation link and the pixel position of each block of content. You can see this declared in the #wrapper style rule. We also know from that style rule that all of the content blocks float left and appear snugly in one row. The first block is positioned at 0 pixels. One block's width away is the second block of content. That is at 550 pixels. Each subsequent block has a position that is 550 pixels more than the block it is preceding. Because we know the exact pixel position each of our content starts at, we can use that information to tell our content slider to slide the wrapper element to the right location so that the content we want is now visible. The third link specifies a data-pos value of -1100 pixels. That corresponds to how many pixels we will need to shift our wrapper container to ensure the third content block appears in focus. Clicking each of the other links will set the left property of the wrapper element to the value stored by the clicked link's data-pos attribute. The links variable gets a collection of all the elements in our document that have a class value of itemLinks. These elements are the list items that act as our navigation links. The wrapper variable is very similar. It gets a pointer to the element whose id is wrapper. Notice how I am querying our DOM. Instead of using something like getElementsByClassName or getElementById, I am using the newer querySelectorAll and querySelector functions. If this is your first run-in with the querySelector* functions, check out my tutorial on them. You will see both of these variables used shortly, so don't forget about them. The activeLink variable is used to store the position of the content that is currently displayed. This variable will make more sense when I describe it in action shortly. What we are doing here is going through each item in our links variable and assigning an event listener to them. This event listener will call the setClickedItem function when the click event is overheard. We add the active class value to our first navigation link element. This is done by passing in the activeLink value to our links array. Because activeLink is 0, this is essentially getting the first element and using the classList API to add a class value of active. Once this line executes, remember the following style rules? Well, these style rules now becomes active and help special case your active navigation link from the other non-active links. We'll revisit these style rules again with a bit more detail. This function first resets all of your links to their non-active state by calling removeActiveLinks. We'll look at that function a bit later. The other important thing this function does is update the value of activeLink by the clicked element's itemID property. This ensures that activeLink is always pointing to a number that corresponds to what is shown. Once it has done these two (pretty boring) things, this function passes a reference to the clicked element to the changePosition function that does a couple of pretty awesome things that we'll look at next. Toggle the visuals of the clicked link to indicate it is currently the active one. 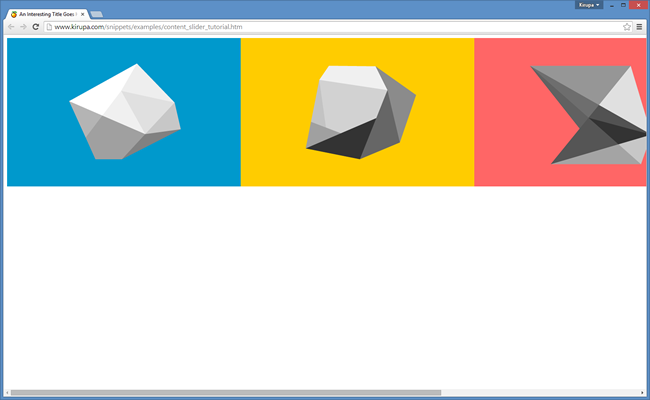 Set the position of the wrapper element. Let's examine these two things in greater detail. You can quickly see that the content block for the 4th link is what is active, and that the first three links are not the active ones. This change in the visuals is done by adding and removing CSS classes. A class called active is added to the active link. Any links that are not active do not have the active class as part of their class value. We violently enforce that as you will see when we look at the removeActiveLinks function. Think of it as a giant reset switch. It goes through each of the navigation links as stored by the links variable and removes the active class value by using classList.remove(). Just know that if any of your navigation links have a class value that contains active, well...it won't have to deal with that any more. The same classList that we used earlier to remove the active class value is the same one we use to add the active class value back to the clicked link. This clicked link is represented by the link argument that is passed in. We are almost done! After all of this waiting and anticipation, we are finally at the part of the changePosition function where we actually set the position of the wrapper element to slide and display the content whose navigation link you clicked. The position variable stores the value from our clicked link's data-pos attribute. Once we have the value of our data-pos attribute, we set the transform CSS property on the wrapper element directly to that value in the form of a translate3d function. It is these values that you pass in that determine how far the slide the slider. And with that, you have just created a content slider from scratch and (more importantly) learned how it works the way it does. Based on popular request, let's look at one optional improvement you can make to your content slider. Currently, our content slider only slides the content when you actually click on one of the navigation links. That doesn't have to be the only way it works. A lot of content sliders tend to slide their content automatically every few seconds in addition to also allowing you to click (like an animal!) to a particular section. Yes, it is our old content slider modified slightly to allow the content to slide automatically. Guess what you and I are going to do next? Every few seconds (or whatever you specify as the value for delay), the setInterval function will cause our content slider to slide over to the next piece of content. When our content slider has reached the end, it will need to loop back to the beginning and restart the sliding from there. All of this isn't difficult. It just requires you to know a few tricks and have a solid understanding of how our content slider works. We'll look at what all of this code means shortly. For now, just plop it all in there. 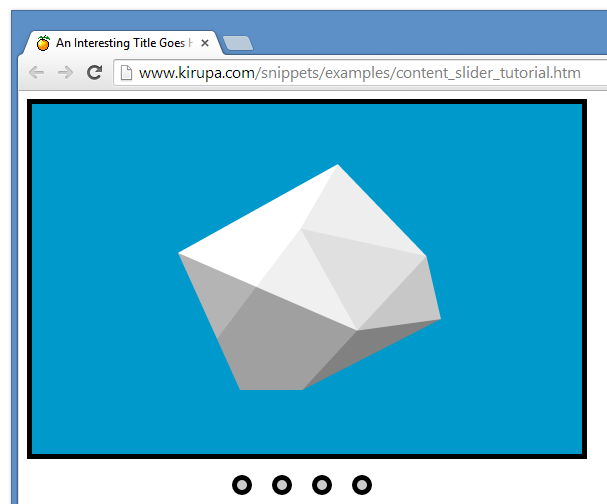 Once you've done this, go ahead and preview your content slider in your browser. You will see your content slider actually sliding to the next content every two seconds. Once you've done this, your content slider will slide automatically in addition to behaving properly when you interfere and click on the navigation links yourself. Yay! The activeLink variable points to the position of the currently displayed content. Each piece of content is associated with the appropriate item inside the links array. The total count of the items inside the links array can be found by accessing the length property. With this out of the way, let's go back to our code. At this point, the path your code takes is no different than you clicking on the next link manually. The star of this is the startTimer function. This function contains the setInterval call that ensures our goToNextItem function is called once every 2 seconds (aka 2000 milliseconds). By simply adding this function (and calling it), your content slider will just start to slide automatically. That's only a sorta kinda good thing, for we do want to reset this timer (what I'll call our setInterval) when you manually click on a link. To handle that case, you have the rest of the code. The way to reset our timer is stop our setInterval function and then start it back up again. The way you do that is a little unintuitive. You store the identifier of the setInterval function that you call, and then you use this same identifier to eventually stop the same setInterval call. Allow me to explain. The clearInterval function takes the identifier (via timeoutID) of the setInterval function that you want to stop. Once you've displayed your new content, you want to give your content slider two more seconds before it moves on to the next thing to display. Keeping track of all this is what the startTimer and resetTimer functions handle. Content sliders come in many shapes and sizes and forms. Some are made up of multiple rows with the sliding happening both vertically as well as horizontally. Some sliders are vertically aligned with the content stacked on top of each other. 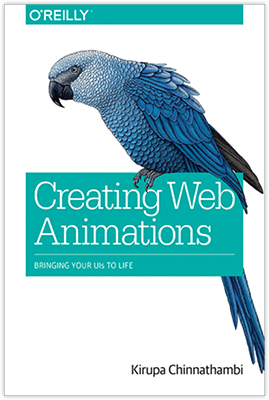 If you are adventurous and would like to use a CSS Animation instead of a transition, you can do that as well with a certain amount of hacking. There is no wrong way to create a content slider. As long as your content slides, you are OK in my book!